The boy is probably nine or ten years old, like so many other little boys sprinkled all over the sandy beaches by the sea, but there is something different here. He is watching. Shovel in hand, he stands motionless, looking toward the sea. I can’t see his face, but my eyes are drawn to his stillness. Seconds pass. 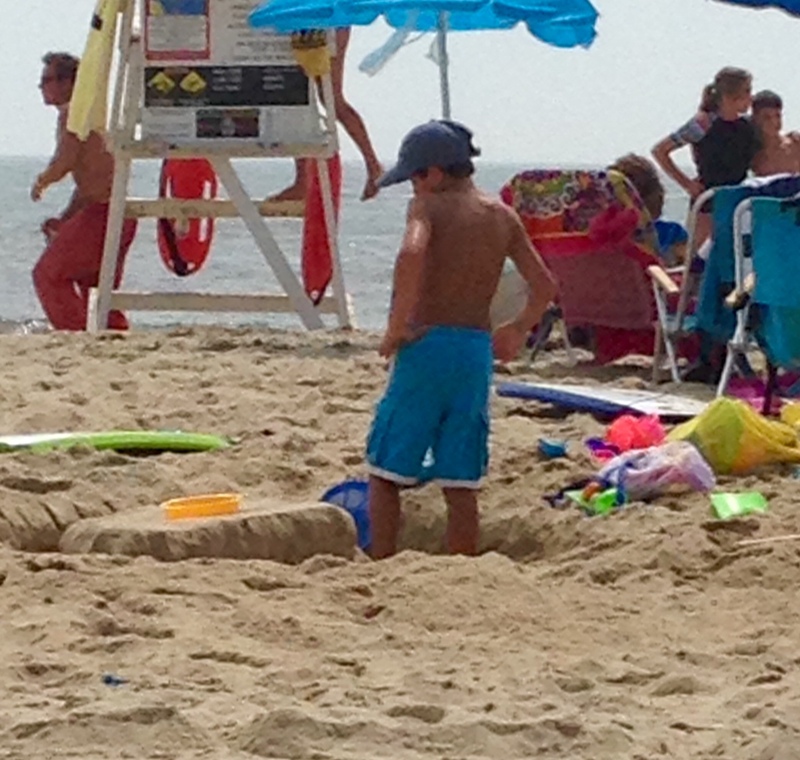 He digs his shovel into the sand. One shovel full, then two – he pauses – then three. He turns, looks to his left; seconds pass, one thousand one, one thousand two, one thousand three, and back to the displacement of sand. The child stops again, looks left, pause, out to sea, pause, to his right, pause, then turning, looks inland. His gaze lingers, looking past me, perfectly still as seconds pass, one thousand one, one thousand two, one thousand three, one thousand four. Returning to his labor, three, now four shovels of sand are tossed to the wind before he pauses once more gazing in each direction. A baseball cap shades eyes that watch, eyes that search. Other children run, squeal, dig, and splash. He also digs, but his focus is not on his labor so much as something beyond. The hole begins to take shape, an arc, but still he stops and looks. A smile erupts lighting the young face as his arm extends in a wave. He has found what he was searching for. Following his gaze, I see the objects of his excitement; one boy of approximately the same height, another about a head taller, and an older teenage girl. Stillness shattered by laughter…the girl smiles and moves on leaving the young ones to their endeavors. From green mesh bag filled with plastic rainbow of tools, come two more shovels, pink and yellow, and the team begins to work in earnest, digging, shaping, patting sand to perfection. Their creation takes form and, after briefly admiring the fruits of their labor, the two late arrivals answer the call of the crashing waves. Some seconds pass; then with one last admiring look, the boy abandons art to attack the rolling foam.